You’re not a professional chef, but you play one at home. Preparing meals for your family and friends is a big part of your life, and something that provides a great break from your work day. You invested in a set of quality knives and pots to make cooking easier, and buy only organic produce and grass-fed meats. These are all extremely helpful in creating healthful meals in your kitchen, but what if there were an added ingredient for easier preparation, serving and cleanup afterward? That ingredient is a chef sink. It isn’t especially new, but it’s gaining tremendous popularity in residential kitchens, especially among serious home cooks, and the pricing and selection continue to improve. 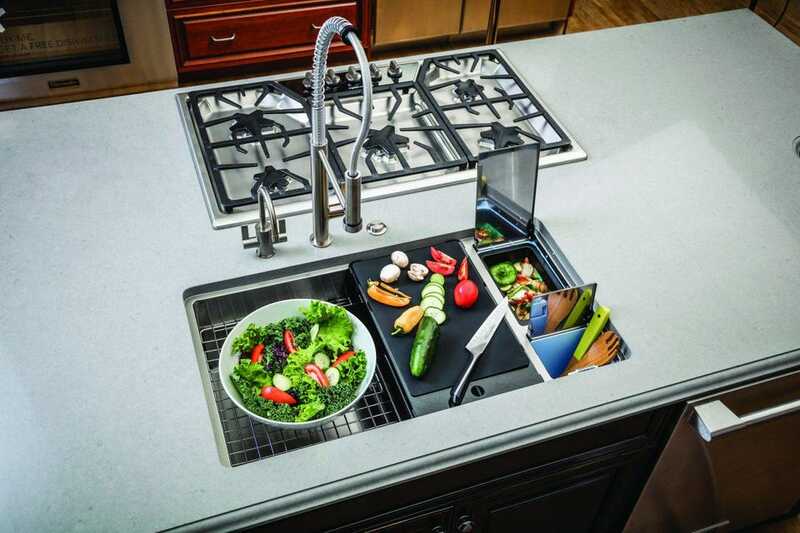 The chef sink – also called a work station sink – typically includes accessories that aid in meal prep, like cutting boards, knife holders, ingredients holders and colanders. It also typically includes accessories for easier cleanup, like drain boards, drying mats and sponge holders. These accessories usually slide across the single or double basin on built-in sink ledges, or secure to the side of the sink. Many of the accessories are dishwasher safe, as well, which further shortens kitchen cleanup chores.